My friend Joan and I went on a roadtrip to PA and W VA. We just had a great time! Our main focus of this trip was to get to Wissmach Glass in Paden City, W Va, and also to Youghiogheny Glass in Connellsville, PA. But of course it's not a road trip if you don't manage to fit just about everything into it. 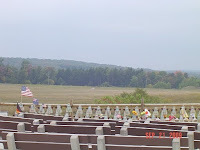 So we also stopped at the Flight 93 crashsite in Schencksville, PA,(very sad..let us not forget their heroism that day.) We went to Pittsburgh and had a very nice dinner at the Church Brew Works, which is a very old church in Pittsburgh that was going to be torn down until someone bought it, had it desanctified and made into a brew pub. We didn't manage to get there during the daylight hours..so sadly we got no pics of the stained glass windows. All the same it was a nice place to visit. And we got out of Pittsburgh just in time..we found out that evening that the G20 Conference was going to be held in the Convention center (which we drove by that night.) Imagine, a couple of days later and we'd have missed that opportunity. We also visited Fallingwater, which is a Frank Lloyd Wright designed home built over a stream. Fallingwater is located in Mill Run, PA and is well worth the visit. It is just beautiful there. The Pennsylvania Conservancy now owns and operates the tours of the home. It was built for the Kaufmann's who owned the largest department stores in Pittsburgh (which later became Macys)but I digress. 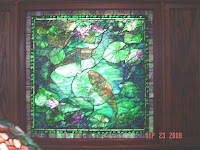 Mrs. Kaufmann also was a Tiffany collector and there are many pieces of Tiffany on display in the house. I was in awe, as during my genealogy search I found that I am distantly related to Mr. Wright (7th cousins)so it was truly an honor to be able to see one of his houses. Last but definitely not least, we did get to Wissmach and met some extremely nice people, including Mark, the owner of Wissmach Glass. They were kind enough to show us the way to the glass they had available for sale and we even received an impromptu tour of the glass making. All together a wonderful visit and that we enjoyed very much. I wanted to take it all home with me..but sadly there's only so much you can fit into the back of a Jeep Liberty. 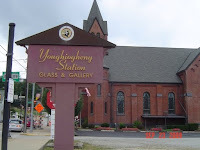 We also visited Youghiogheny, unfortunately we were in such a hurry most days we forgot (I forgot) to call and reserve time for a tour, but we did get to see the Youghiogheny store and purchase glass there. Such beautiful glass, many beautiful and reasonably priced items in their gift shop. I'm ready to move there just to be closer to all of this absolutely lovely glass! Needless to say we were in glassers heaven. 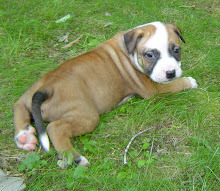 I'll post pictures of what I bought soon. 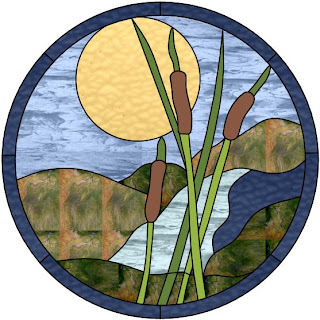 Living in an area that has lots of water and lots of cattails I just had to design this one. And it's one that I will no doubt make as I'd just love to look at it (until it's sold of course!) 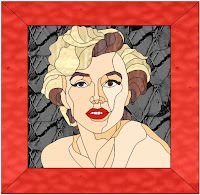 This will be made into a fairly large round panel, I'm thinking about 30" in diameter. 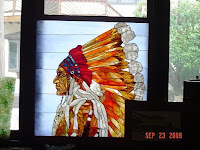 And of course I just got back from a glass shopping trip where I purchased some of the most beautiful Youghiogheny glass that will be just perfect for this panel! More about that trip later. This panel was made by one of my students recently, since we live in the great State of Maine it was only fitting that this panel would appeal to her. She did an excellent job on it I think. The pattern came from Aanraku's Official State Flowers II book, with an addition of the two outside borders. She used some very pretty glass in this panel which brought out the texture and organic quality to this piece. 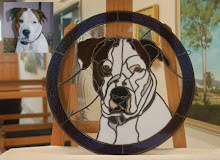 Human faces are not easy to accomplish in stained glass, I've seen a few artists that have been successful with it. Chantal Pare' and Jean Beaulieu come to mind as artists that are able to capture human features very well. This is my stab at it..I think they are recognizable at least, but would have to be done as larger panels in order to achieve the details involved. At any rate they were fun to work with and I appreciated all of the terrific feedback I received from my peers on AOG, without it they wouldn't have turned out nearly as well!